In this post, we examine five of the best-selling drain cleaners on the market. These cleaners are usually a liquid that you pour down your pipes in order to unclog them. Chemical drain cleaning products use chemical reactions to either take or give electrons to the substance that’s clogging your drain. These products, through their chemical reactions, generate heat. These products can be caustic, oxidizing, or acid, which isn’t typically sold to consumers (Source). While there are a multitude of products that can unclog your pipes, experts recommend you check the chemicals used in the product to ensure they’re safe for your pipes and surfaces. For example, you may not want to use to harsh a cleaner on your expensive bathroom sink. Also, if you’re unsure, it’s always a good idea to ask a reputable clerk or consult an online source for help (Source). In this article, we’re going to look at five good products that should clear your drain right up. First up is the Oates Glug Drain Opener. This product uses non-acid crystals to effectively free up your drain of clogs and keep them running freely. What’s nice about this product is that it’s safe to use on most metal and plastic pipes and fittings. You can use this to remove stubborn clogs or as regular maintenance to keep things flowing. Lastly, this product is relatively odor free, so you won’t have to worry about it stinking up your house when you use it. Roebic K-67L is ideal for cleaning out drains and traps. This product comes in a liquid and is also safe for use on almost all pipes and fittings. Like the previous product, this can be used to clean stubborn clogs or used as a general maintenance plan to keep your pipes running smoothly. Although most users had positive reviews of this product, some said drains needed more than the required dosage to fully treat the clog. 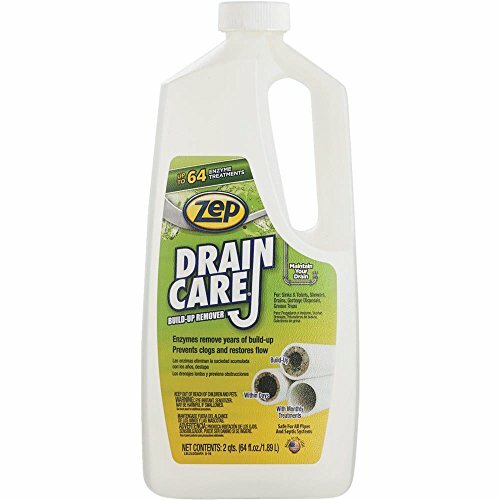 Zep Drain Care is a liquid that comes in a 64 oz. jug, which should be enough to last for a month or more. Users had mixed reviews about this product with some saying it works as advertised while others said they didn’t see much improvement even after using the whole bottle. Instant Power 1501 is a liquid cleaner designed for stubborn and sluggish pipes. It features a lemon scent to help deal with those nasty odors that often come with pipes that have years of buildup in them. This cleaner is both safe and beneficial for septic systems and is made with mostly natural ingredients. Users liked the scent and said a little went a long way. Last is the Scotch 1503, which is also scented to control nasty drain odors. Like the previous, this one is made from natural ingredients and is environmentally safe and safe for septic systems. The enzyme formula digests most materials that clog drains. Using this product on a regular basis will keep your drains running freely and your garbage disposals smelling much better. 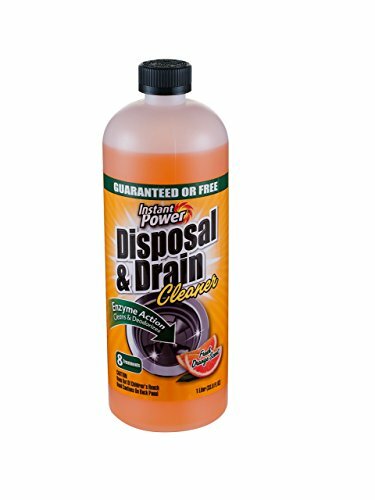 This drain cleaning solution offered by Scotch is easy to use, efficient, and an excellent choice to get rid of unpleasant disposal odors. Users love that it’s environmental-friendly and the orange scent, but some do note that they are disappointed with the results. The Scotch instant drain cleaner features a special enzyme formula designed to break down the food particles clogging the pipes, and it’s safe for all plumbing pipes, so you don’t have to worry about erosion. What’s more, it’s beneficial for your septic system, and the manufacturer recommends that you use it weekly for the best possible results. As a whole, users have a mixed opinion of the instant power cleaner, and they agree that it works but not as well as they expected. An unhappy buyer mentions that he used a whole bottle on his kitchen sink and there was no improvement. He adds that it smells good, but it’s not useful for clogged drains. Another user states that the stink disappeared only for a day or two and that he could hardly detect the cleaner’s orange scent. On the other hand, a happy purchaser mentions that Scotch formula is perfect for keeping drains unclogged as long as you use it regularly. He also shares that you must let it sit for a couple of hours. 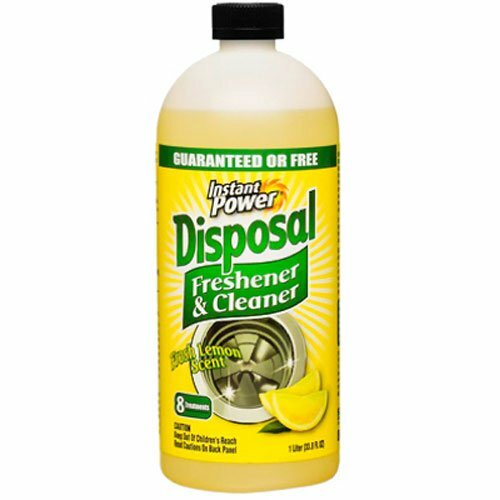 If you are wondering how to unclog your kitchen sink and get rid of the garbage smell, you can try this drain cleaner with lemon scent offered by Instant Power. Users love the pleasant smell, but some do note that it doesn’t work as well as they expected. The Instant Power liquid features an enzyme formula to break down the clogged material and improve your disposer’s operation. Another great thing about this product is that it contains natural ingredients, and it’s safe and beneficial for septic systems. To achieve better results, you need to use it weekly. A reviewer comment that he is satisfied with the efficiency of the Instant Power product and that he recommends it as one of the best drain cleaners available. He mentions that the bottle contains enough to last you a couple of months. Another user states that it does an excellent job and de-stinks the drains and the disposal. He adds that it might take you a few days to notice the difference. On the other hand, an unhappy buyer shares that he would unclog his sink faster if he uses vinegar and that the only advantage of the product is that it smells good. Another purchaser says that his pipes are still clogged even after he poured a whole bottle and that it doesn’t work at all. This liquid pipe cleaner offered by Enforcer is affordable, useful, and an excellent choice to keep your drains working smoothly. Users love the price and the efficiency of the product, but some do note that it doesn’t unclog as well as they hoped. The Enforcer features an enzymatic formula to clean and remove build-up clogging material from your pipes and improve the flow. Another great thing about this product is that it’s safe for all septic systems, and you won’t have to worry about clogging anymore if you use it regularly. The bottle contains 64 oz of liquid. A reviewer comments that he has been using the product for more than one year and that he highly recommends it as one of the best drain cleaners. He adds that it unclogs sinks quickly and efficiently as long as you follow the instructions. He advises that you use it at least twice a month to keep things flowing. A user also mentions that he is using the liquid for maintenance and that he hasn’t had any problems for months. On the other hand, an unhappy customer points out that he used the whole bottle and the drain remained sluggish and slow. He states that he there are better alternatives available that would work within the hour. 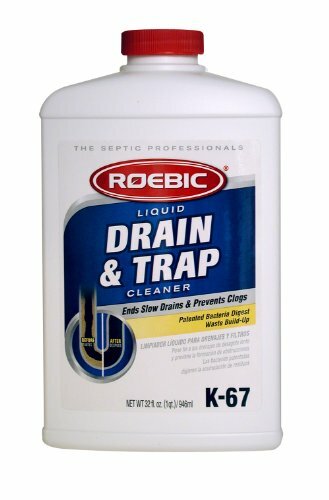 If you are wondering what to do about your sluggish drain, you might take a look at this liquid trap cleaner offered by Roebic. Users love the price and the strong odor, but some do note that it works too slowly for their liking. The Roebic 32-ounce drain cleaner features an enzyme-based formula that will remove the build-up layers of clogging material in your pipes. What’s also excellent is that the liquid is certified biodegradable and non-corrosive so that you don’t have to worry about damaged pipes or burnt skin. In addition to this, it’s suitable for all plumbing systems, and you can use it monthly for better results. A buyer mentions that he was skeptical about the efficiency of the Roebic product, but it worked far better than he expected. He shares that he hasn’t had problems with clogged sinks since he has been using it. Another reviewer comments that you might have to pour more than the specified amount of K-67, but it will do the job sooner or later. He highly recommends it as one of the best drain cleaners. A user also states that he is happy with the liquid cleaning solution and that it’s perfect for maintenance. However, a couple of customers have complained that the cleaning liquid doesn’t work for them. They add that they didn’t see any improvement after several days of use and that the pipes remain clogged. This liquid Glug cleaner offered by Oately is effective, safe for use, and an excellent choice for emergency situations or regular maintenances. Users love that the effectiveness of the product, but some do note that you shouldn’t use it on garbage disposals. The Oately Glug septic opener features non-acid crystals to unclog sluggish drains and prevent blockage, and it’s harmless to metal/plastic pipes, valves, and fittings. What’s more, the formula won’t solidify in the pipes, and it contains no phosphates or aluminum. Another great thing about this product is that it doesn’t produce odors or fumes like other openers and it’s safe for all septic systems as long as you follow the provided directions. 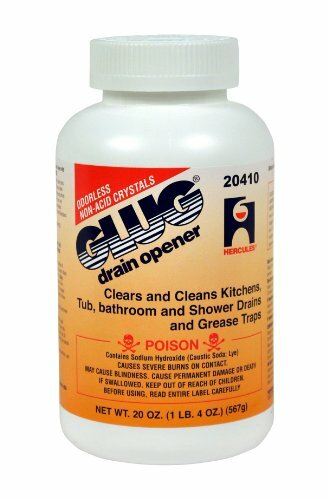 As a whole, users have a high opinion of the Glug liquid opener, and they highly recommend it as the best drain cleaner available. A purchaser states that he saw a huge improvement after the first use and that it worked where other similar products have failed. He adds that you have to handle it carefully or you might get burnt. Another buyer mentions that the instructions are a bit difficult to read, but there are YouTube videos to help you. He also says that you need less than a cup to do the job. However, a couple of customers have complained that the Glug didn’t work out for them and that they were disappointed with the results. They also warn that it smells awful. 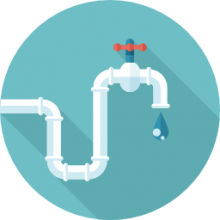 The overall functionality of a house gets affected if its drain pipes, or if sewers are badly clogged. It can cause a bad odor throughout the house, increase backflow of water and you will have to compromise with the environment in your home. This type of drainage problem compels many people to call the plumber to fix the situation- or perhaps use a ‘sani stick’ or drain snake, which you can purchase at Walmart, Target or Home Depot. It can be an expensive affair, however, for most homeowners as the pipe clogs could be pretty stubborn. Another effective and easier alternative solution for this drainage problem is the use of drain cleaners. These cleaners can help in unclogging the drainage system of your home by getting rid of the blockage and obstruction. Normally people do not understand the role of these cleaners in making the drain work properly. In this write-up, we are going to discuss the working of drain cleaners in unclogging the drains of your kitchen, bathrooms and other similar areas in your home. You can find a wide variety of drain cleaning products on the store from which you can choose one as per your requirement. These products are available in powder, gel and liquid forms from which you can choose as per the size of your problem. In order to quicken the process of cleaning your drain, you can mix some other chemicals in these cleaners. All of these substances react collectively to the things obstructing your drain to clear it out. The way they working differs from each other. Powder drain cleaners help in moving the obstruction by creating heat around it whereas the chemicals or enzymes used in liquid cleaners help in unclogging the drain with the chemical reaction of the bases or acids used in them on the obstruction. People usually prefer using enzyme-based cleaners as they are safe for the flooring as well as plumbing system of their kitchen and bathrooms. Moreover, they provide a long-term solution for this problem. It is less risky to use enzyme based cleaners to unclog your drains but it may take a bit more time to work properly. It may take few hours to get rid of your drainage problem with enzyme based cleaners. Though their reaction is slow but they are safe for the pipes and floors of your home. In order to get rid of irritating blocked drainage system as soon as possible people usually go for chemical cleaners as they work very fast as compared to the enzyme based cleaners. You will have to follow instructions provided on the package while using chemical drain cleaners. In fact, they can damage the pipes of your home internally, if used excessively. You must mix chemical cleaners in water to create enough amounts of heat and gas required to unclog the drain efficiently. But while using chemical based cleaners in combination with other chemicals you should be careful as they can damage the pipeline as well as the fixtures along with increasing the risk of catching fire. In this video, this DIY YouTuber coaches you on how to unclog your kitchen sink using things around the house and simple and easy steps- instead of using something like the Liquid Fire option. They talked to their plumber not too long ago, and he told him that it's not always essential to have a plumber over to unclog your drain. It is possible to go ahead and do so yourself with simple household items that you probably already have. Two ingredients are essential- you'll need baking soda and you need white vinegar. Many of you might be tempted to unclog your drain using a plunger. Well, that may partly unclog it. Having said that, remember that your drain is normally coated with a bunch of gunk and grease and all the stuff that goes down there over time. So, in order to loosen that up, you have to have a chemical reaction, some kind of a foaming chemical reaction, and this is exactly why we have vinegar and baking soda, so you will see how easy these steps are. You are probably going to be done in a matter of minutes. So step number one is going to be to pour one pot of boiling water down the drain. Step number two is going to be to pour one cup of sodium bicarbonate, also straight down the drain and you're going to want to let that sit for roughly 5 to 10 minutes. Step number three: you are going to include one cup of white, vinegar and you're going to pour that down the drain as well. You will see a chemical reaction between your baking soda and the vinegar, but don't worry about it- that's needed. There's probably going to be a lot of foaming action going on kind of like whenever you were young and doing those scientific research experiments in a volcano. Keep in mind that baking soda + white vinegar really make things 'go boom', so you are going to allow that to mixture do its thing for another five to ten minutes. Step number four: you are going to add another pot of boiling water down the drain. Finally, the last and final step number five: you are going to run hot tap water for 5 minutes, in order to ensure that all things in the drain are properly flushed away.